Have you or a loved one suffered a serious injury due to a slip and fall accident? No Expenses or Fees Unless You Win Your Slip and Fall Lawsuit! New York Slip And Fall accidents can occur in an instant and result in significant injuries. These cases can be complicated, which is why you need a lawyer who understands the law and recognizes that your injuries need to be taken seriously. Parker Waichman LLP is an established personal injury and premises liability law firm, and we have years of experience litigating these cases. Contact one of our dedicated attorneys today to discuss your potential for filing a lawsuit if you have been injured in a slip-and-fall accident. In hiring us to pursue your claim, you can feel assured that your case is in the hands of experienced professionals with a track record of success. We have secured tremendous results for our clients through the years, and we are ready to add your case to our list of favorable outcomes. $4.5 million for a man who sustained fractures to his left elbow, left wrist, and ribs after falling over a stanchion that remained on a sidewalk after a light pole had been removed. $2.7 million for a woman who fractured her ankle when her shoe became caught in rotten wood planks on a train platform. $2.4 million for a man who tripped over a galvanized electrical conduit in the sidewalk and fractured his humerus and left elbow. $400,000 for a tenant who sustained right arm fractures after falling on construction debris in an apartment building stairwell. We know that your injuries are not something to shake off, and we will fiercely advocate for you to receive deserved compensation from the owner of the premises on which you fell. Our clients and their families are extremely important to us; they are why we are in this business. Parker Waichman LLP is representation you can count on during this difficult time. Call or email our firm today to find out how we can help you obtain the result you need. If someone falls from a height, such as when a balcony railing gives way, the consequences can be devastating. Many of these injuries require surgery to repair, and some end up requiring multiple surgeries and extended hospital stays. All of these injuries have detrimental effects on the victims’ lives. They suffer physical and emotional damage and have to undergo costly medical treatment while taking time away work and time away from their families. As the financial burden increases, people start to feel like they have nowhere to turn. This is where a dedicated attorney can step in to help. The attorneys at Parker Waichman LLP understand how your injuries have affected you, and we want to help you recover the compensation you need to cover your medical expenses and make up for the time you have had to take off work. We will guide you through the legal process and bring some much-needed peace of mind to you and your family. 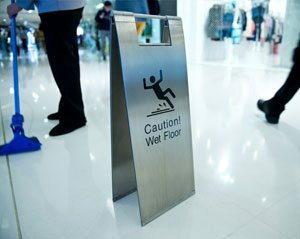 Your slip and fall injury was caused by the dangerous condition on the premises. New York law requires that the premises owner has had a reasonable time to correct the dangerous condition. For instance, during a snowstorm, the owner needs reasonable time to clear off the walkways and parking lot before a person would be able to bring a viable cause of action for slipping on the snow. In addition, upon learning that maintenance needs to be completed, the owner must be allowed a certain amount of time to carry out such maintenance. Owners have a duty to make sure that their premises are safe for patrons and customers. People expect to be free from harm while they are in a public place, and owners need to perform routine maintenance to make sure they are aware of all potential dangers. If they fail to perform necessary sweeps of the premises and regular upkeep, people can be injured in slip-and-fall and trip-and-fall situations. When people are injured in this way, they should hold the premises owners accountable. Our lawyers understand the law on these cases, and we know what it takes to win. Though these can sometimes be difficult claims to resolve, Parker Waichman LLP will get to the bottom of what happened in your case and tenaciously seek the outcome you and your family deserve. Before filing your slip-and-fall or trip-and-fall case, you must make sure your right to file has not expired under the state statute of limitations. A statute of limitations is a time limit on filing your claim that is imposed by state law. These time limits can act to permanently bar your claim if you do not file in time, regardless of the merits of your case. One of the reasons states pass statutes of limitations is to preserve the integrity of the judicial process. If you file your case expediently, you will tend to be prepared with more reliable evidence. However, if you delay, any witnesses you might call will have had more time to forget what they saw, and any documents or records you need might have been lost or destroyed. Also, states have an interest in conserving resources that potential defendants might expend in indefinitely preparing for anticipated litigation. All states have their own statutes of limitations that vary based on the type claim and the nature of the allegations and injuries. Generally, New York has a three-year statute of limitations on filing slip-and-fall and trip-and-fall cases. This means you have three years from the date of the accident to file your claim. However, the unique facts and circumstances of your case can change that calculation. This is one of the reasons it is very important to work with a skilled attorney who will determine the correct time limit to file your individual case. The attorneys at Parker Waichman LLP are diligent about investigating cases to calculate the statute of limitations right away. Our attorneys want to make sure that we have enough time to put together the strongest case we can and file it in the correct court. Contact our New York office today to discuss your case and your potential statute of limitations. How Can a New York Slip And Fall Lawyer in New York Help Me? Loss of consortium damages for the ways your injuries have affected your relationship with your spouse. When you hire our New York law firm, you can be confident we will do everything we can to obtain the highest level of compensation possible. Our law office has secured more than $2 billion in settlements and verdicts for our clients, and we will advocate for your individual needs. During your accident case, our attorneys will stand by your side and make sure your voice is heard. If you have been injured in a slip-and-fall or trip-and-fall accident, do not delay in hiring counsel to protect your rights. Parker Waichman LLP can begin your case investigation today and dedicate the time and attention your claims deserve. Draft and file a Petition for Damages on your behalf. These are just the steps leading up to the filing of your case, at which point we will initiate additional discovery, including depositions. If your slip and fall case progresses to trial, you will feel assured that you are represented by people who have the skills and experience necessary to achieve the verdict you need. Call our office to talk with us today about the services we will provide to you and your family. What Should I Do if I Have a Slip-and-Fall Accident? Seek medical attention. – Regardless of how you feel, it is necessary to seek medical attention after a severe fall. You need a medical evaluation to make sure you do not have any severe injuries and receive proper care in the event you have been harmed. Remember, you have a right to request a copy of your medical records following the conclusion of your treatment, and having these records in advance can help to speed up your legal case. Make a note of the situation. – After your fall, look around to see what you tripped or slipped upon. It will be important for you to understand what caused the accident so that your attorney knows where to start at the outset of your case investigation. Document your surroundings and injuries. – If you have a camera or camera phone and can take photos, it will be extremely helpful for you to take photos of the condition that caused you to fall and of any injuries you have suffered. If you need to wait to take some photographs of your injuries, you should do so as soon as you can to document the injuries as accurately as possible. It will be necessary to have evidence of the condition that caused your fall and the nature of your injuries. Notify the owner. – Following a fall, the premises owner needs to be notified that you fell, why you fell, and how you have been injured. You can do this while you are still there if the owner is present, but be sure not to make any statements accepting any blame for your injuries. You unquestionably should not sign any documents, as the owner might try to get you to waive a lawsuit. It is sometimes best to wait for your lawyer to make any contact with the owner. Hire an experienced attorney. – After you have slipped or tripped and fallen, you need to hire a skilled lawyer to investigate your claim and seek damages for your injuries. The lawyers at Parker Waichman LLP have extensive experience with these cases and will help you secure the compensation you need for your injuries. By following these important steps, you will be on track for a successful accident claim against the premises owner. However, if you are unable to accomplish any of these, do not worry. Our attorneys will perform a thorough workup of your claim and uncover all the evidence you need to obtain the best result possible. The legal system is difficult to understand, especially when you are filing a claim against a premises owner that undoubtedly has experienced insurance counsel determined to undermine your claim. We try to take some of the stress out of this experience for you by implementing a very simple process for beginning your case investigation. The first time you contact our office, you can initiate a review of your claims and obtain your free initial consultation with one of our skilled New York premises liability attorneys. We know that following an injury from slipping or tripping and falling, you are likely already under some financial strain as medical bills come in. That is one reason we offer case consultations for free. Your initial meeting with us is at no cost to you, and we will investigate your case without ever asking for money down. If we happen to conclude that we cannot move forward with your case, you never need to be concerned you will someday receive a bill from us. The expenses we have incurred will not be yours to pay. If on the other hand, our lawyers find that we can proceed with your case, we will advance the costs of litigating your claims. A lawsuit can be costly, and we recognize everyday people cannot afford the expenses associated with prosecuting a New York Slip And Fall claim. This is why we assume the financial risks of litigation ourselves by offering free consultations and contracting all our slip-and-fall and trip-and-fall cases on a contingency fee basis. This means that we only get paid if you get paid. Our recovery is dependent on yours, so if you don’t receive an award, you won’t owe us a cent. Why Hire Parker Waichman LLP? Our attorneys know the thought of hiring a lawyer and filing a lawsuit in court can seem a little overwhelming, but by hiring Parker Waichman’s lawyer for your case, you can be confident we have the resources and experience you need to achieve justice. No case is too complicated for our skilled lawyers, and we will work tirelessly to give you and your family results. During our personal injury and premises liability practice, we have received numerous accolades and honors from our colleagues, judges, and current and former clients. We recognize how vital a favorable result is to you and your family, and we know you are trusting us to protect your valuable rights. We take that very seriously. When you work with our firm, you are partnering with attorneys who care about you and care about making a difference. Contact our firm today to find out more about how we can ease the burdens placed upon you and your family. “Preeminent Lawyers” an AV Peer Review Rating by Martindale-Hubbell® – which has rated attorneys for over 100 years. If you were involved in slip-and-fall or trip-and-fall accident in New York, contact our firm today for your free consultation by filling out our online form or by calling 1-800-YOURLAWYER (1-800-968-7529).